I read an interesting stomach-turning diet coverage by Associated Press' Tsvangirayi Mukwazhi. The writer wrote about people consuming worms, or to be exact, caterpillars. But like what people say - one's cure is other's poison. so, let's not pass the verdict indiscriminately. 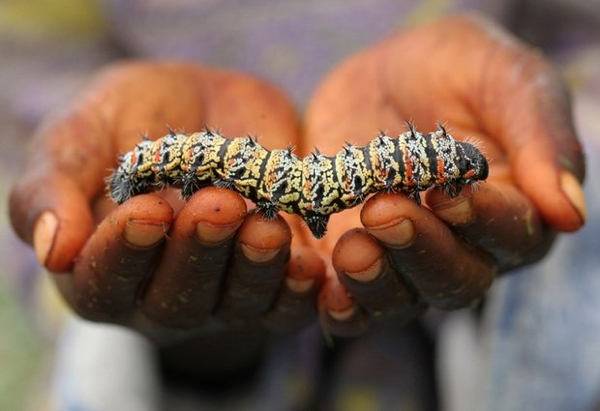 Mopane worms are large edible caterpillar found in much of Africa. A mopane worm hatches and as it grows, it sheds skin 4 times in its five larval stages, after which the mopane worm is considered most suitable for harvesting. Otherwise it goes into pupal stage and transforms into giant moth, commonly called emperor moth due to it size. The worms can be eaten dry, as crunchy as potato chips, or cooked and drenched in sauce to enhance the taste. 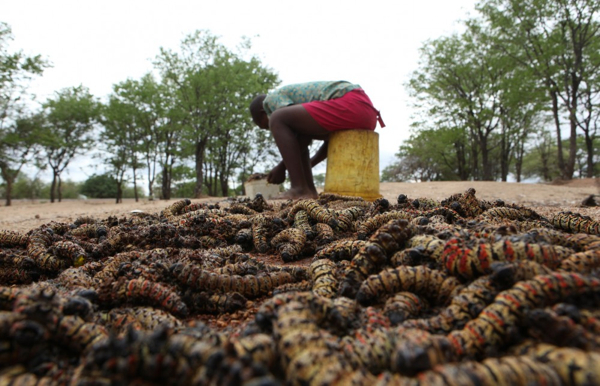 Mopane worms are high in healthy nutrients and contain 3 times the amount of protein as beef. Eating worms is less taxing on the environment than consuming beef because it takes far fewer leaves to produce worms than it does feed to produce the same amount of beef. 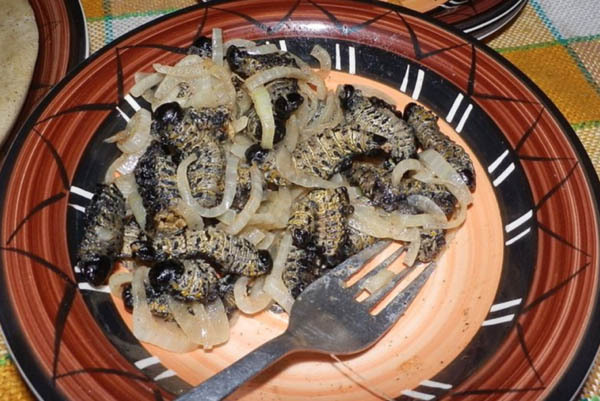 Dried mopane worms have even been exported to other countries and can be found in African restaurants in Paris. 500 grams dried mopane worms; three tomatoes, diced or 1 can of tomatoes; two onions, diced; 1/2 teaspoon turmeric; three fresh green chilies, finely chopped; three cloves of garlic, finely chopped; tablespoon of fresh ginger, finely chopped. Soak dried worms in water for 3-4 hours to reconstitute. Fry onions in groundnut oil on medium heat until translucent. Add turmeric, chilies, garlic and ginger. Fry for about five minutes. Add tomatoes and cook on low for about 20 minutes until spices are well blended. Add drained worms and cook until they have softened a bit but still are a little crunchy. Salt and pepper to taste. Serve with pap, called sadza in Zimbabwe. I would prefer the local "butod" than this hehe..